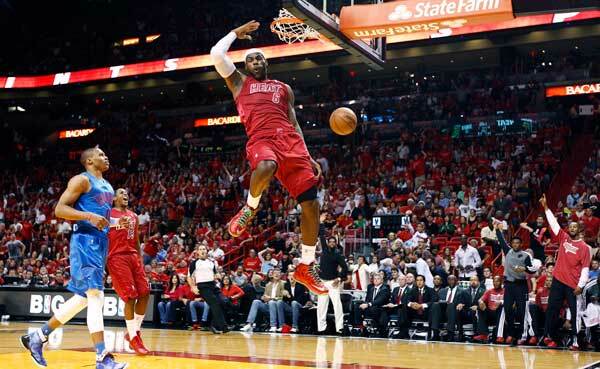 Will LeBron James Finally Dunk for a Crowdfunded $1 Million? Ever since he entered the NBA in 2003, LeBron James has had basketball fans dreaming of the day he finally enters the dunk contest and blows their minds with a series of reality-suspending slams. But James has steadfastly sat out the contest, which has in many fans' estimation devolved into a derivative, yawn-inducing shell of its former self. But if the winner walked way with a check for a million dollars? Twenty-eight-year-old NBA fan Chris Thomas is aiming to make James reconsider. How? A crowd-funding campaign to accumulate $1 million in pledges to the "LeBron James Family Foundation", thereby enticing James to bless fans the world over with his prodigious dunking talent. If he enters, his foundation gets the cash. If not, the money will be dispersed back to the original donors and no one loses a dime. Traction has been slow since launching the campaign two weeks ago, however, and Thomas says the site has so far sparked far more pageviews than donations, which currently total just under $4,000. Thomas hopes one big donation can help generate some momentum, but says he'll approach the foundation with whatever the campaign totals in the next couple weeks. "We'll raise as much as possible, whether that's $50,000, $500,000 or $5 million," he says. "Whatever aggregate amount is raised, I'll contact the foundation and anyone else associated with LeBron, say 'take or leave it' and see what happens." Could the crazy plan work? It's doubtful, but James does take his foundation seriously. In a classic sports moment that went viral just last week, he joyously tackled a fan after the man hit a half-court hook shot to raise $75,000 for the foundation and the Boys & Girls Clubs of America. Would you donate to this campaign? Let us know in the comments.